Apple on Tuesday lowered trade-in values for its iPhone Reuse and Recycling Program in the U.S. and Canada, cutting as much as $45 off the value of older generation handsets like the iPhone 5. 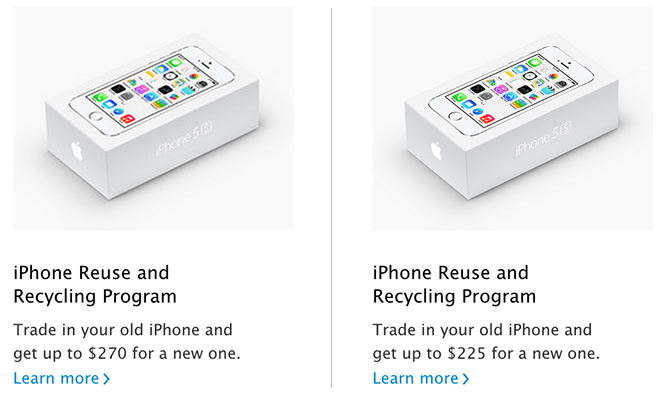 As seen in the above photo, Apple's new recycling pricing appears to max out at $225, down from a price of $270 advertised through the company's website on Monday. The lower iPhone valuation was first spotted by iPhone in Canada. Confusingly, while advertised in-store trade-in pricing has dropped, Apple's Reuse and Recycling online site is still showing payouts of $255 for good condition iPhone 5 units. Values should be consistent across both online and physical stores as Apple outsources its Reuse and Recycling program to a third-party vendor. The new rate change is in stark contrast to Apple's previous recycling efforts. In August 2012, Apple began offering up to $345 for then-current model iPhone 4S units under the rebranded "Reuse and Recycling" program. The company has yet to start accepting trade-ins for the iPhone 5s, but that is expected to change with the upcoming iPhone refresh this fall. In May, Apple launched a special promotion for upgraders by offering up to $199 for iPhone 4S units, or $99 for iPhone 4 trade-ins, with the credit to be put toward the purchase of a new iPhone 5s or 5c. Apple first rolled out its product buyback program in partnership with California-based recycling contractor PowerON in 2011. Since then, the recycling initiative has expanded beyond the U.S. and Canada to the UK, as well as France and Germany. As of April, the recycling effort now includes free recycling of Apple products at all brick-and-mortar Apple Store locations. Outside of Apple's Reuse and Recycle program, third-party firms like Gazelle and eBay offer up to $360 in cash for 64GB iPhone 5s models. Those looking to upgrade to a newer model or simply offload old hardware can check out AppleInsider's Trade-in Guide for the latest deals.